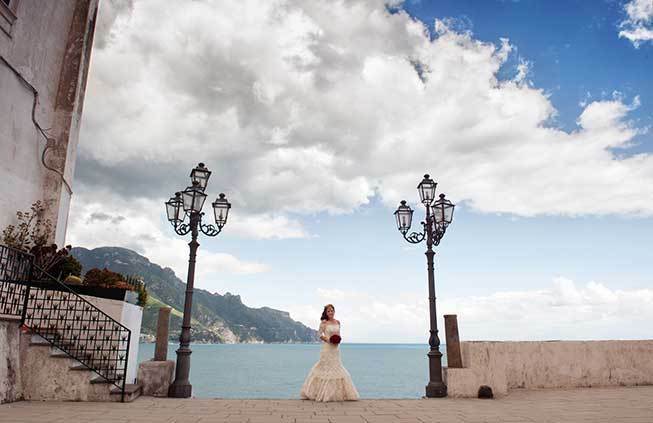 Get married in Atrani, a delightful fishing village of the Amalfi coast, only a few miles away from Amalfi and Ravello. This is the smallest town in southern Italy and one of the few places where the typical structure of a medieval town is magnificently preserved, with its labyrinth of narrow streets, arches, courtyards and small squares, deserving Atrani to be listed among the most beautiful villages of Italy. The Piazzetta, the central square surrounded by the typical Mediterranean white houses, with its pleasant and lively atmosphere is like an open-air living-room. The houses are built on top of each other: at evening, when lights turn on and "lampare" (fishing boats) depart from the beach, the whole village looks like a life-size nativity scene. The name of "Atrani" is thought to come from the Etruscan word "atru" (dark, obscure): a beautiful and impressive "dark spot" surrounded by steep cliffs rising from the sea. So small, and so full of history: in the early Middle Ages Atrani was the residence of the noblest families of Amalfi. The "dogi" - the highest authorities of the Maritime Republic of Amalfi - were crowned here, in the church of St. Salvatore de' Birecto. This ancient church dates back to the 10th century and is named after the crowning ceremony, when a cap called "birecto" was solemnly placed on the head of the "doge". The collegiate church of St. Maria Maddalena was built in the 13th century in thanksgiving to the Virgin Mary, for her protection against Saracen pirates. 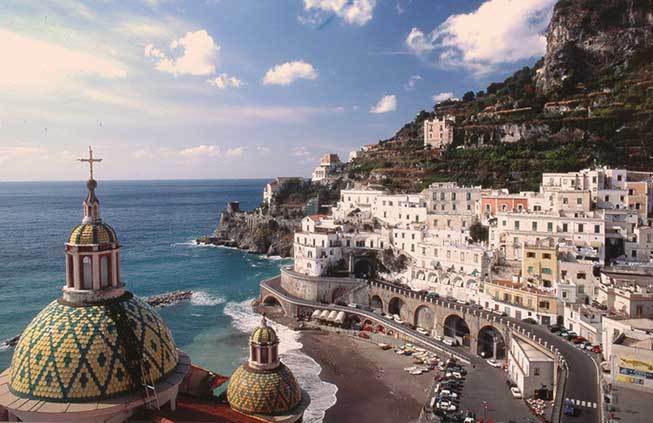 Its beautiful dome covered with tin-glazed majolica tiles is one of the symbols of Atrani. Atrani is a truly delightful village, do not miss the opportunity of a romantic wedding ceremony in this little paradise surrounded by the sea and blessed by the sun. This is a perfect spot for wedding pictures! 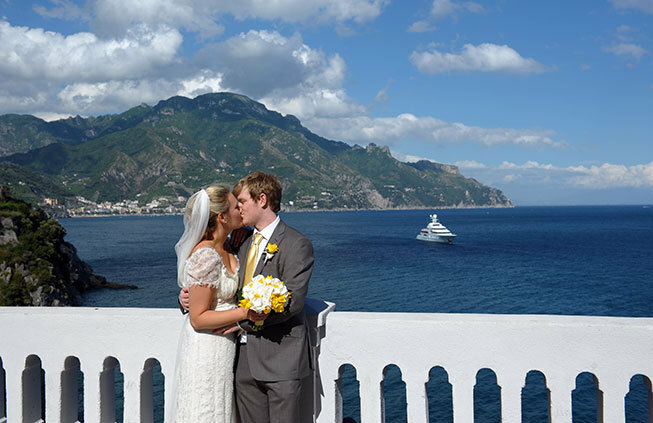 Getting availability for a wedding in Atrani is not a problem even if you are booking a couple of months in advance. Prices for ceremonies venues are much more affordable compared to the other villages. 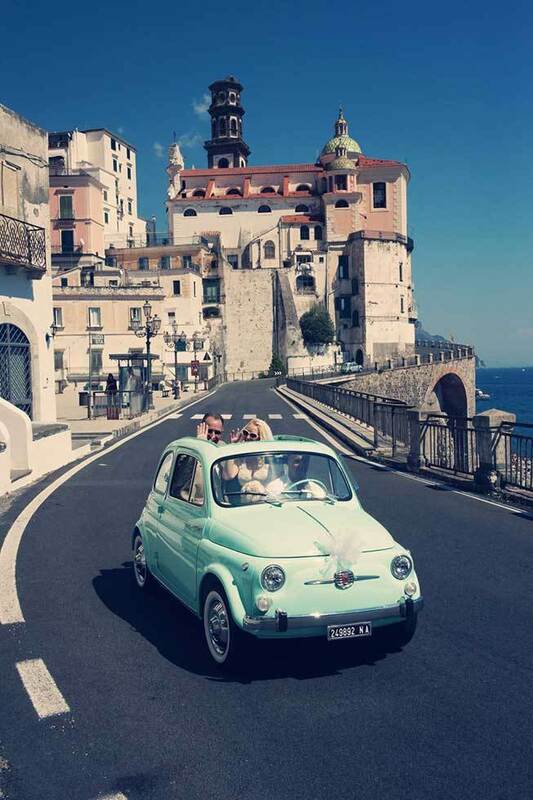 Closest accommodation is located in Amalfi or along the Amalfitana drive. 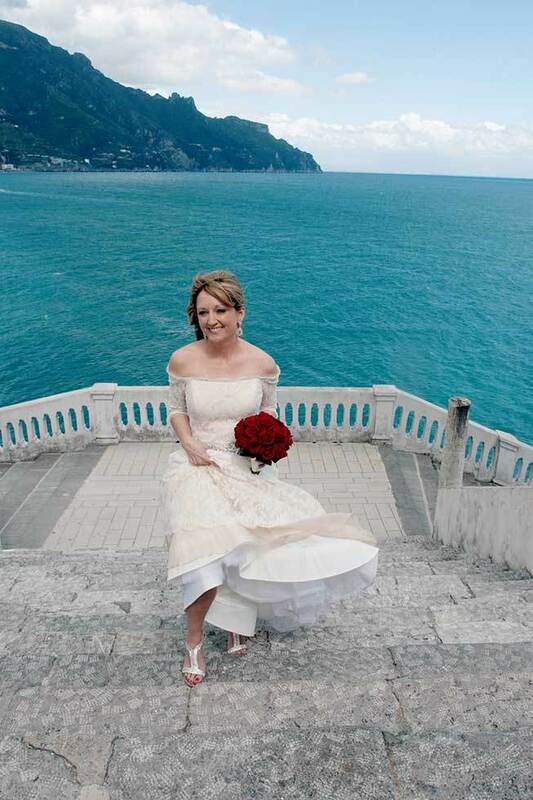 Are you interested in knowing more about Atrani weddings? Do you have a specific question? Your dream wedding is just one click away, contact us today. Words cannot express how sincerely both Steve and I appreciated the extraordinary service, support and "end product" you delivered for us. To say it was a perfect day is a completely truthful statement and in some ways does not do it justice. 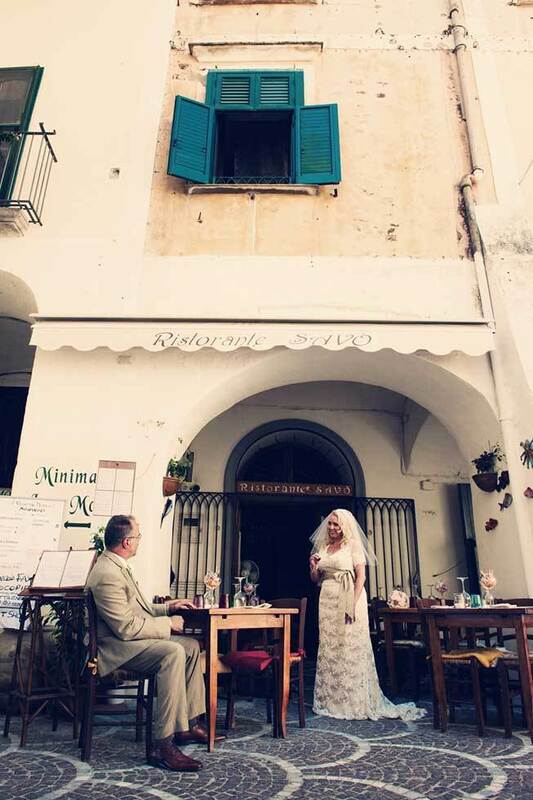 Civil weddings in Atrani are performed at the local registry office, a simple building located in the very heart of town. The marriage hall can be reached by an impressive alley that leads to the municipality from the centre of town. The interior hall is simple and intimate with blue tiles floor. The room can hold up to 40/50 guests. This is the ideal location for couples wanting a more secluded and less known location. 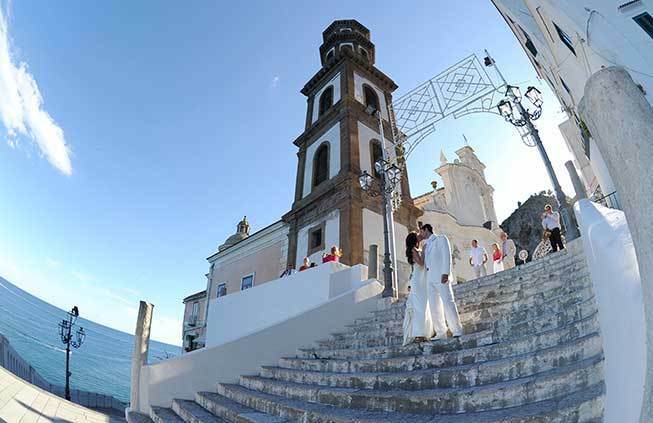 Catholic weddings can be organized in the wonderful church of Santa Maria Maddalena in the very heart of Atrani, set romantically between the sea and the sky. The collegiate church of Santa Maria Maddalena was built in the 13th century by the people of Atrani in thanks to the Madonna for saving them from the Saracen marauders. It has a single rectangular room, covered by a barrel vault and lit by two large Baroque windows. The façade is also Baroque. The glazed tile dome and square bell tower have become the symbol of the Atrani skyline. This church was built in the 13th century and stands in a picturesque Piazza with a prominent position facing the Gulf. The church boasts an impressive Baroque façade, with a majolica dome and an impressive bell tower. This catholic church is one of the few churches on the Amalfi Coast where protestant ceremonies are allowed. Ceremonies are performed by Protestant pastors and can be marriage blessings or legal binding ceremonies. Being the town very small, few locations are available for a symbolic ceremony in town. 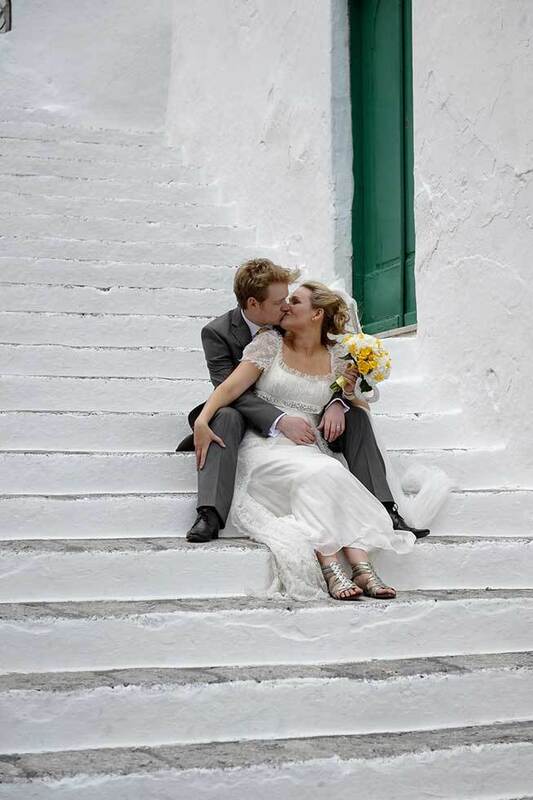 In particular we recommend a wide panoramic terrace overlooking the sea for small and intimate wedding ceremonies or down at the beach of Atrani.